We are back from Adpeticon! I’ll be posting more over the week as my mind recovers, but that was a FULL weekend. We had 10 go from the Outriders to the Mecca of wargaming. I played in the 40k Championships. Jon played in the 40k Gladiator. Dan played in the Warmachine tournament on Friday. Russ, JT, Travis, Adam, Cooki, DanGor played in the 3k fantasy tournament on Friday. Myself, Dan, Russ, JT, Travis, Adam, Cooki, and DanGor all played in the fantasy championships on Saturday. Adam/Travis and JT/DanGor played in the team fantasy tournament on Sunday. Suffice to say, we were busy. I ended up 1-1-2 in 40k and 2-2 in Fantasy, I was comfortable with my outing in 40k since I mainly wanted to be a part of it and have fun with not the best competitive expectations, but I was a little frustrated with my 2-2 finish in fantasy – I made a couple of poor tactical choices but had some dice go against me too. However, that’s the nature of the games we play: sometimes the dice just don’t work out. I was shooting for at least 3-1 in fantasy, but that didn’t stop me from having a great time. I plan on posting info on each event/day, but if you’re on the fence on going: it is totally worth it! We had a blast, and I came home with a TON of stuff, Demigryph knights, 30 of the old Empire spears I found for like $20 in great, unpainted condition, some cheap Cygnar stuff, and some cheap Battlefleet Gothic! That's Dan, Travis, and Adam all on the top 8 tables. The highest I got was table 15. 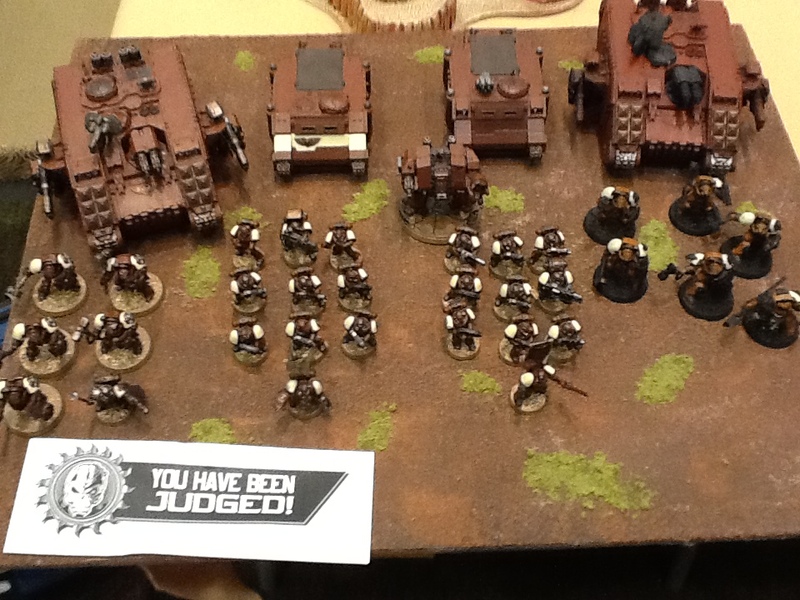 A great showing by the Outriders at our first Adepticon event. I will say to anyone wanting to go next year: bring some cash. On Friday night the 40k hall turns into a bazaar and it is a buyer’s market. One of our friends, Thomas, walked away with 100 Saurus, a ton of skinks … essentially a full Lizardmen army … for $40. One thing I will say, however, is that I’m glad we went with the decision to start a little earlier on Saturday for 40k to get out by 7:15 for the Bugeater. Each morning at Adepticon we were all jazzed and ready to go, but by the last round we were burn out. 10:30 pm finish times are no fun. By doing two rounds in the morning, we avoid having to do a long dinner break, and instead people will just have a later dinner at 7:15 and the whole night ahead of them. I had a great time, and will definitely go back next year. Posted in Warhammer, Warhammer 40k and tagged adepticon, bugeater gt, warhamer 40k, Warhammer.